Luke Thorpe is just an ordinary fifteen-year-old wimp; a maths geek who is socially invisible and totally hopeless at sports. But now some mysterious and violent changes are threatening to rocket him out of obscurity! He’s started to howl rather than sing the hymns in assembly, and sudden growth spurts are causing his clothes to rip off. Worst of all, he’s started to sport thick, shaggy wolf fur! Join this reluctant hairy hero on a journey full of embarrassing mishaps, as he discovers his werewolf roots, joins a pack – and finds himself en route to war against the vampires, whose numbers include a rather wimpy but familiar face! 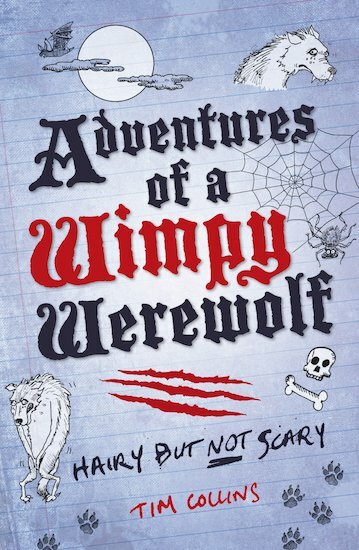 Howling laughter and blood-chilling chuckles are in store in this hysterical follow-up to Diary of a Wimpy Vampire. I think I read another book like this, but i enjoyed both of them. Tim Collins won the Manchester Fiction City and Lincolnshire Young People’s Book Awards for Diary of a Wimpy Vampire Kid.